Play only if it is Night. If it is Day, Gug characters you control gain Toughness +1. 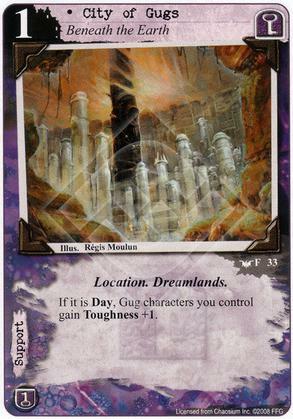 Opponents play with the top card of their deck revealed. 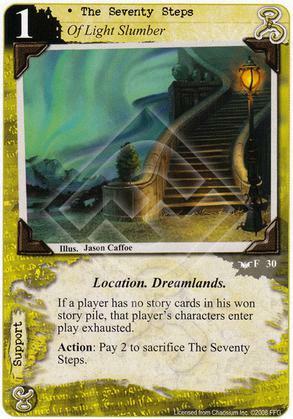 Response: After an opponent places a success token at a story, that player draws one card. 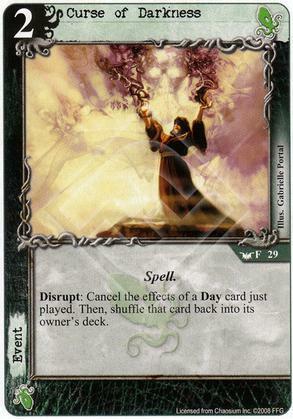 Disrupt: Cancel the effects of a Day card just played. Then, shuffle that card back into its owner's deck. 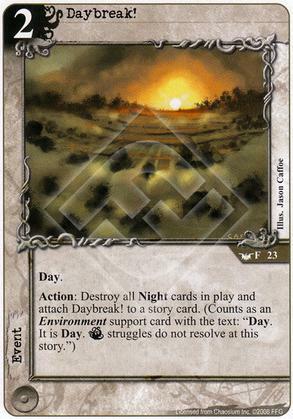 Action: Sacrifice one Deep One character to destroy all Day cards in play. Then, attach Day of the Deep Ones to a Deep One character. 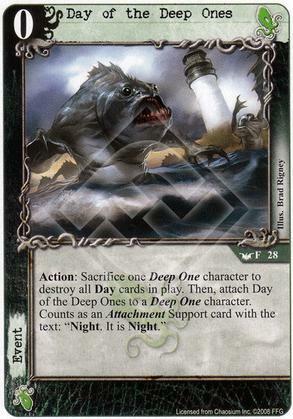 Counts as an Attachment Support card with the text: "Night. It is Night." 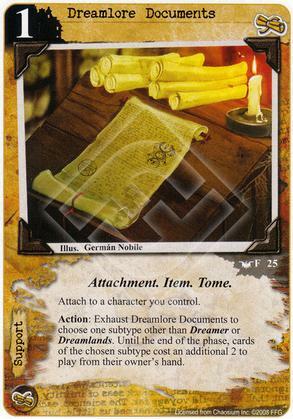 Action: Exhaust Dreamlore Documents to choose one subtype other than Dreamer or Dreamlands. 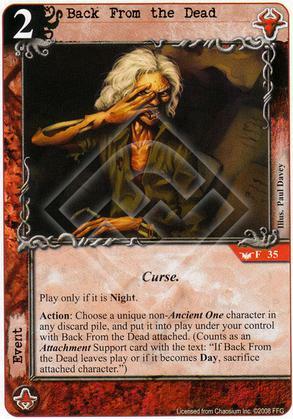 Until the end of the phase, cards of the chosen subtype cost an additional 2 to play from their owner's hand. 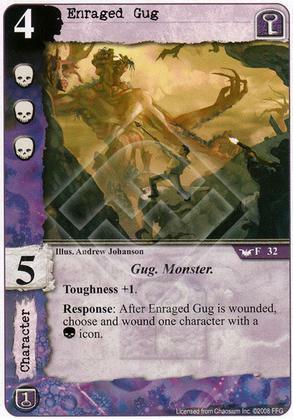 Response: After Enraged Gug is wounded, choose and wound one character with a (C) icon. 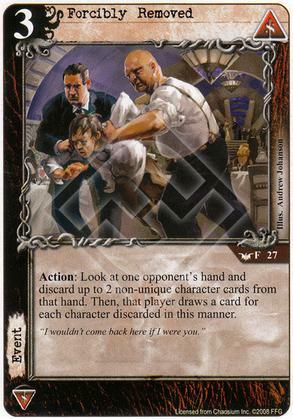 Action: Look at one opponent's hand and discard up to 2 non-unique character cards from that hand. 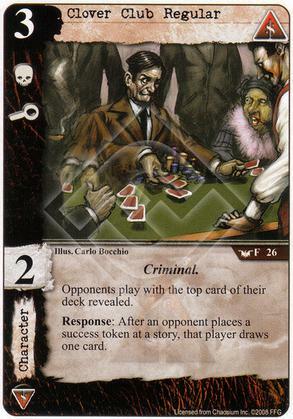 Then, that player draws a card for each character discarded in this manner. "I wouldn't come back here if I were you." 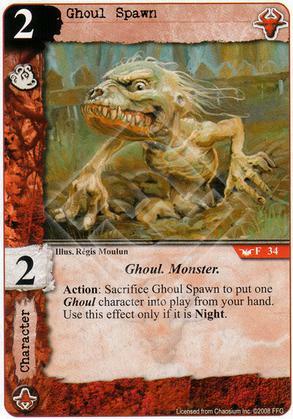 Action: Sacrifice Ghoul Spawn to put one Ghoul character into play from your hand. Use this effect only if it is Night. 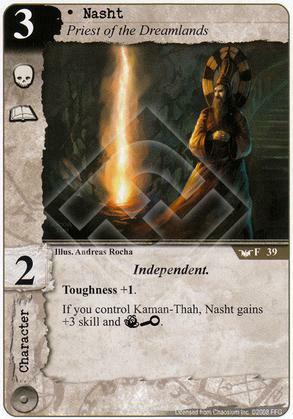 If you control Nasht, Kaman-Thah gains +3 skill, and (C)(A). 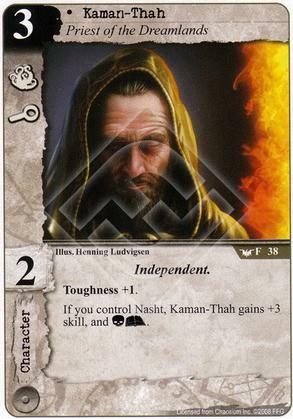 If you control Kaman-Thah, Nasht gains +3 skill and (T)(I). Action: Discard a resource from a domain you control to ready Obsessive Insomniac. 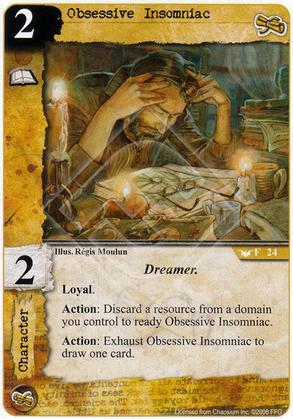 Action: Exhaust Obsessive Insomniac to draw one card. Attach to an [Agency] character. Attached character gains (C). 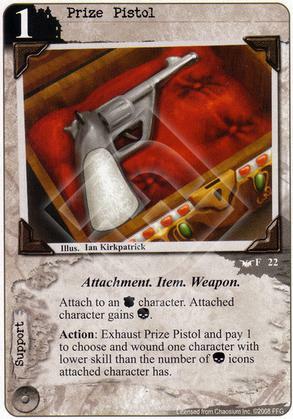 Action: Exhaust Prize Pistol and pay 1 to choose and wound one character with lower skill than the number of (C) icons attached character has. 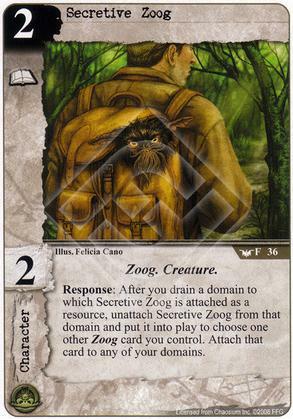 Response: After you drain a domain to which Secretive Zoog is attached as a resource, unattach Secretive Zoog from that domain and put it into play to choose one other Zoog card you control. Attach that card to any of your domains. 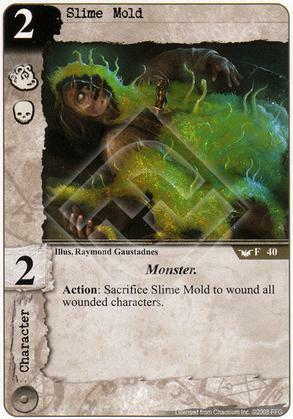 Action: Sacrifice Slime Mold to wound all wounded characters. Action: if it is Day, pay 2 to choose a story. Until the end of the phase, count The Captain's icons and skill towards that story without committing him to that story. 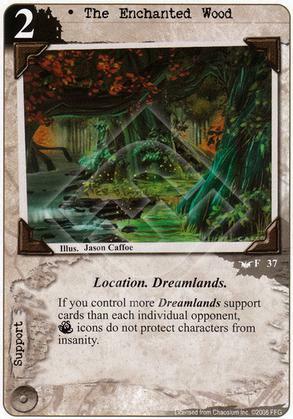 If you control more Dreamlands support cards than each individual opponent, (T) icons do not protect characters from insanity. 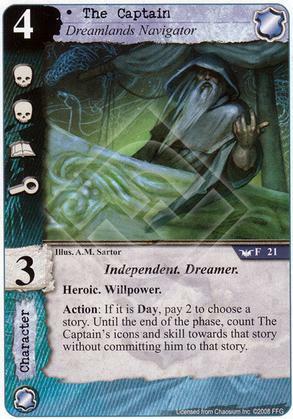 If a player has 2 story cards in his won story pile, that player's characters enter play exhausted. Action: Pay 2 to sacrifice The Seven Hundred Steps. 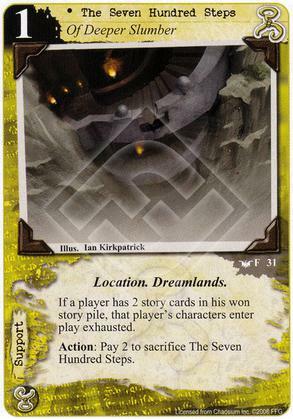 If a player has no story cards in his won story pile, that player's characters enter play exhausted. Action: Pay 2 to sacrifice The Seventy Steps.